Zhi Ping Ren graduated from the well known First Military Medical University in Guangzhou, China in 1985 and completed his general practice and residency in both Western medicine and Traditional Chinese Medicine (TCM) at Nanfang Hospital in Guangzhou, China. Zhi Ping Ren worked at the Department of TCM as a TCM doctor supervised by the highly respected Prof. Zhang Xiansong, focusing on pain management in Chinese orthopedics. He also worked at the Department of Internal Medicine as a Western doctor and at the Department of Pathology as a pathologist at Nanfang Hospital. 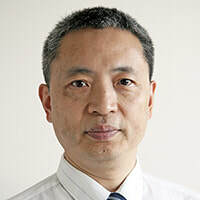 To further his training in diagnostic pathology and tumor biology, Zhi Ping Ren went to Sweden and was awarded his Doctoral Degree in Medical Science in 1996 from Uppsala University. He completed his fellowship at the Department of Pathology, Memorial Sloan-Kettering Cancer Center in New York City. He was appointed in charge of the molecular pathology division in solid tumor pathology, research and development lab, and microdissection center core facilities at the Department of Genetics and Pathology, Uppsala University Hospital, Sweden and was appointed as Associate Professor in Molecular Pathology by Uppsala University. While working in Sweden, Zhi Ping Ren continued to practice, educate, and promote Traditional Chinese Medicine. He established the Chinese Health Center clinic with branches in both Uppsala and Stockholm to treat patients with acupuncture, tuina (Chinese osteopathic manipulation), and nature herbal remedies. He taught TCM to undergraduate students at Uppsala University and conducted lectures around the world in molecular pathology and TCM. In 2006, Zhi Ping Ren moved to Toronto and worked at the Department of Genetics and Genome Biology, Research Institute, the Hospital for Sick Children, and Sanjiu Medical Center as a TCM practitioner intermittently. In 2011, he opened his own acupuncture and Chinese medicine clinic in Toronto. Invited to give lectures in Sweden, the US, Canada, Norway, Switzerland, the UK, and China for over hundreds of lecturing hours during Zhi Ping Ren’s stay at Uppsala University, Sweden, Memorial Sloan-Kettering Cancer Center in New York City, and the Hospital for Sick Children in Toronto.